A man suffered minor injuries during a one-vehicle motorcycle accident early Wednesday afternoon on Washington New Martinsburg Road. According to the Fayette County Sheriff’s Office, the bike was heading southbound on Washington New Martinsburg when the motorist lost control going around a curve. The bike slid off the right side of the roadway and into the ditch. Fayette County EMS transported the man to Fayette County Memorial Hospital for treatment. First responders, including Sheriff Vernon Stanforth, were on the scene following the accident. 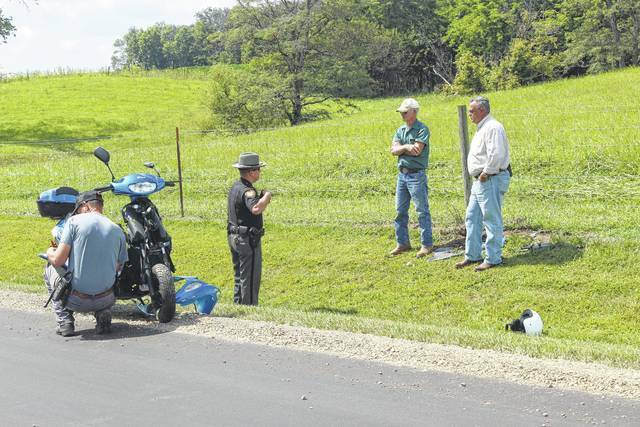 https://www.recordherald.com/wp-content/uploads/sites/27/2017/08/web1_IMG_9488.jpgA man suffered minor injuries during a one-vehicle motorcycle accident early Wednesday afternoon on Washington New Martinsburg Road. According to the Fayette County Sheriff’s Office, the bike was heading southbound on Washington New Martinsburg when the motorist lost control going around a curve. The bike slid off the right side of the roadway and into the ditch. Fayette County EMS transported the man to Fayette County Memorial Hospital for treatment. First responders, including Sheriff Vernon Stanforth, were on the scene following the accident.